﻿These delicate ORCHID small earings by ISABELLE LELOUP JEWELRY are handcradfted in Belgium. 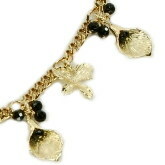 Each earring is embellished with a rhodium-plated brass leaf and 4 small black agates. - Hook fastening is in 925 sterling silver and rhodium-plated. For pierced ears.